I travelled to Limerick to check if Mayo were still contenders and to try to find some signs of hope for our near neighbours, the locals. The day was hot. The Bedouin would be eating 99s in this heat. The massive Mayo support were waiting for the shady side of the Gaelic Grounds to open up, long before the stadium opened. It was hard to escape the irony of it all. Just a few short weeks ago the pale people of Ireland were paying big money to go abroad in search of the sun and now we are queueing up for the shade of the Mick Mackey Stand. Just outside Mungret, no more than a few kilometres from Limerick city, there were two men in straw hats surveying the just-cut hay. The mower was gleaming in the sun and the scene was from another time and place - when every field was cut for hay. Most of the Limerick support are from the west of the county. It could be they were suffering from a condition known as "farmers' guilt". This occurs when there's work to be done and the farmers feel guilty about taking time off from bog and meadow. Patrick Kavanagh summed it up best: "The queen of hearts still making tarts and I not making hay." The official attendance was 8,203. The 8,000 were from Mayo. Declan Harney, originally from Roscommon but very much married to a Mayo woman, greeted us with, "I see you have come back to visit the scene of the crime". This was a reference to Kerry's win over Mayo here in a semi-final replay in 2014 when Mayo felt hard done by. Declan made the remark in jest but Mayo do harbour a genuine sense of grievance. Mayo have been wronged more than once. There is anger there and hurt. This Mayo team and their fans are on a mission to right wrongs. 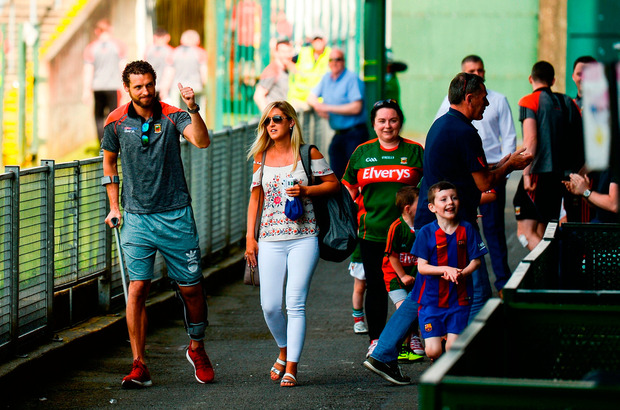 The Mayo fans cheered every player on and off the pitch. The love is another reason why Mayo do so well in the qualifiers. This is all in support. One woman had 'Mayo for Sam' tattooed in the no man's land above her chest. 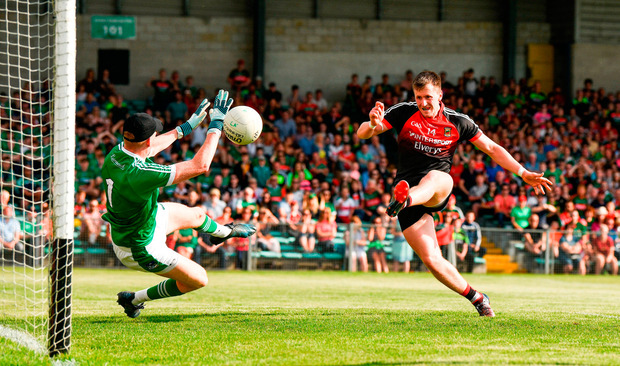 After the Siege of Limerick on Saturday, I came to the conclusion Mayo are far from finished. They will take beating again this year. Mayo looked very fit. I have never seen the O'Shea brothers in better shape. Aidan dominated when he was in the game. The new boys all did well. And when Andy Moran and Lee Keegan came on Mayo showed pure class. Moran jinked and jived on his tippy toes as if he was walking barefoot on a melting-hot asphalt roof. Leeroy Keegan has made a full recovery from injury. He was as good as ever. And he is still edgy. Mayo destroyed Limerick with several goals midway through the second half but Limerick scored three of their own. Some will say Mayo should have eased up and gone for points. I disagree. You have to respect every team and Mayo needed a lift. This was no drill but it was perfect practice for tougher days to come. Mayo have changed their passing game to short, sharp offloads, with several players running at all sorts of angles and always going forward - a plan that might just send the cursed blanket on the ground. Mayo are as good as they were last year. Cillian O'Connor scored three goals and will go close to winning Player of the Year. He strengthened up over the winter and is made in to a man now. Are Mayo 2018 good enough to win an All-Ireland? Maybe. What we can say, with some certainty, is Mayo are one of the few teams who have some sort a chance of ending the Dublin dream of four in a row. Limerick never gave up and scored three goals. The middle one was the best. Danny Neville from Ballysteen, where the spuds are a dinner on their own, is already a near-certainty for assist of the season. Danny won possession around halfway, out on the right wing, and he jinked through several Mayo tacklers. Then Danny spotted the last Mayo defender had taken a few steps too far out from his man. He kicked in a perfect 55-yard pass, with side spin, right into the hands of Seamus O'Carroll, who took the goal so well. Limerick did everything right tactically. Manager Billy Lee knows his stuff. Billy hit out last week over the lack of support given to his team from on high. This is not just a Limerick problem. Last year the homeless Cork footballers had to go begging for a place to train just a few days before they nearly beat Mayo. The question Limerick must ask themselves is do they want a football team? The footballers wear the same jersey. It's about parity of esteem. I hope Mayo get a handy draw this morning. They have more stops on the journey this year than a bus full of men who drank too much after a game. Mayo are still there, and come September, they might well be the last men standing.